We spend a lot of time thinking about how to communicate with our babies. We sing to them, read to them, talk to them, use different tones of voices . . . but what about how babies communicate with us? Believe it or not, they are telling us all about it from the moment they are born. With their cry. Any new parent knows, babies have a way of getting their point across. Did you know that there are actually six different types of cries? Each of them convey a different message. It is important to be in tune to the subtle differences in cries so that we can effectively meet our baby’s needs. It is also important not to squelch the cries with a pacifier when the baby is truly trying to tell us something. Most cries differ in sound, frequency, and pitch and are accompanied by other cues to help us figure out what the baby is saying (or screaming). A hungry cry is typically a repetitive cry that is also rhythmic and usually accompanied by rooting or sucking on hands. Try to respond to this cry fairly quickly because if the baby gets too worked up, they end up gulping air as they attempt to eat, which just results in bellyache and, you guessed it . . . more crying. 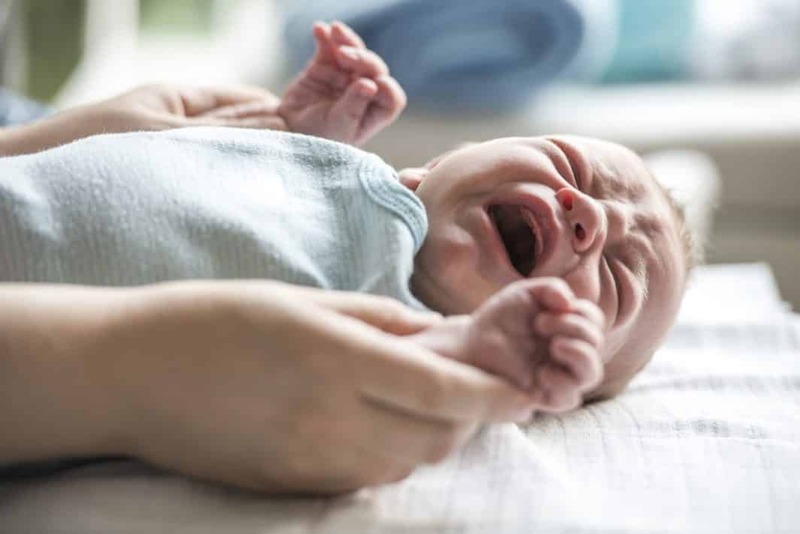 The “I’m in Pain” cry is a sudden onset of a high-pitched, panicked, ear-piercing type of cry that the baby releases in long wails leaving them breathless. The baby will then pause between wails to gasp for air, then repeat another long, sustained high-pitch cry. You obviously want to respond to this cry as soon as possible as well. Try to figure out what could be causing pain and address the issue as you swaddle, rock, shush, and soothe. It is usually related to a belly ache or gas pain. Baby massage to the abdomen or bicycling the baby’s legs toward the belly can be helpful. This is a time when a pacifier or clean finger might be helpful because sucking does release endorphins for baby and that will help to counteract any discomfort they may be feeling. Some babies are very sensitive and easily stressed out, resulting in a “stress cry” which is a general fussiness accompanied by baby turning her head away from stimuli. Try moving your baby to a calmer environment, swaddling for comfort, and using white noise to keep your baby relaxed. Babies can simply be bored. This cry will start out as a coo, or an attempt to get your attention, then turn into fussing, and then bursts of indignant crying as they complain that they are not getting enough interaction with you. This is when NOT to use a pacifier. Pick your baby up, and give him tons of attention and cuddles. Of course there is the colic cry, intense screams accompanied by rigid limbs, red face, and fidgeting movements. This often starts in the evening and can last for hours. Baby massage can help, but should be done in advance of the crying outburst. Placing the baby on her belly and also doing the bicycle exercises while on her back can also be helpful. Lastly, there is the sick cry. This might sound like soft, nasal whimpers that are lower pitch than the other cries. Check for a fever when you hear this cry. Of course, some babies just cry for no particular reason at all. They are babies and that is what they do. It can be discouraging if baby is not easily soothed, but remember to take care of yourself first! When baby is inconsolable, it is okay to lie them safely in the crib while you step out to take a few deep breaths. Also don’t feel bad about handing your baby off to a friend or family member who can relieve you for a little while. There is nothing wrong with taking a little break now and then. Soon the cries evolve into babble and words and they become little experts at making their needs known.